As most of you know, I’ve been on bedrest the better half of this week since the embryo transfer on Wednesday. I’m doing all I can to stay rested, calm, and just laying around. Let me tell you – all of those things are difficult. I have a hard time shutting my brain off to sleep well. Staying calm with all these feelings of excitement, doubt, happiness, and fear… yeah, not easy. Oh, and the laying around part… I absolutely hate asking for help. I don’t like that I have to ask my wife for every little thing. I feel like I’m putting her out. And on top of all that, my body is just not used to just laying for so long. I will continue to take it easy over the weekend, but I may have to get out and go for a walk and maybe cook something without relying on someone else. We had to come up with a number of meals that my wife could make for us while I was down and out. This can be quite a challenge, as I’m the sole chef in the family (obviously). Luckily, we were able to come up with a few ideas that have turned out just wonderfully. We also had to think up some easy-to-grab snacks. If you remember earlier in the week, Monday’s dinner was Bran Muffins, topped with an amazing Honey Vanilla Protein Butter. When we made these, we kept in mind that they would be perfect for the days I would by down and need to just grab a snack without much effort. 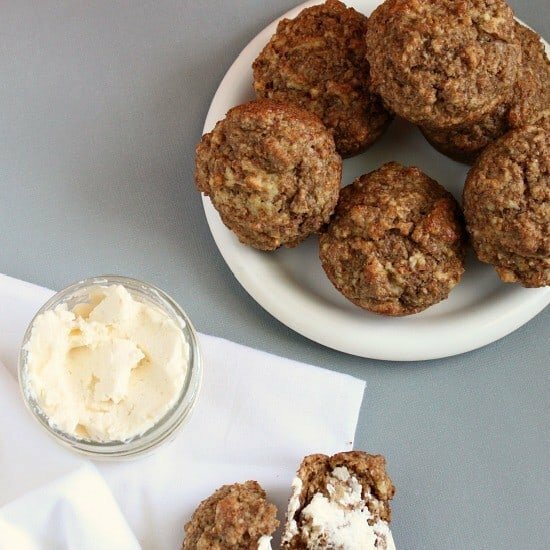 These bran muffins are the ones Tiff’s mom used to make for her family. Yes, they’re the ones from the back of the All-Bran box. I have made a couple of adjustments to make them a bit healthier. First of all, I substituted unsweetened applesauce in for the oil. Also, instead of using regular milk, I used almond milk. There was absolutely no change in flavor, they were so much more moist because of the applesauce. 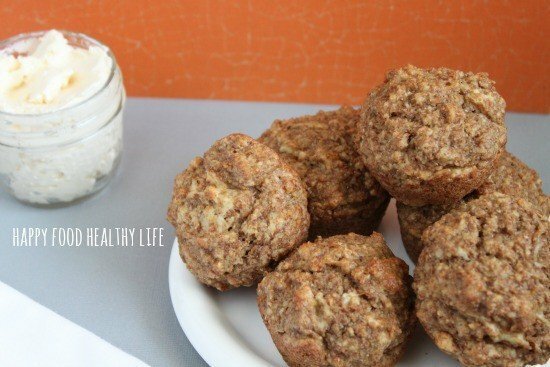 With just a small amount of preparation, between my Dark Chocolate Almond Energy Bites and these Bran Muffins, I have had some awesome and healthy snacks that I can just grab easily. In a large mixing bowl, combine Kellogg's All-Bran cereal and milk of your choice. Set aside and let sit while cereal softens. Stir together flour, sugar, baking powder and salt in a medium bowl. Set aside. In the cereal mixture, add egg and applesauce. Beat well. Add flour mixture, stirring only until combined. Portion evenly into twelve 2 1/2-inch muffin-pan cups coated with cooking spray or coconut oil. Looking for other Easy & Healthy Snacks? Thanks Kiersten! Bed rest really was boring and started to get pretty depressing… especially with my mind having so much time to think about all the what-ifs. Luckily I’ve been able to get up and out of the house the last couple days but still taking it easy for the next couple weeks. i hadn’t had them in a long time myself… was so glad to have been reminded of my love for these muffins. You should check out my Honey Vanilla Protein Butter to put on these… it’s aMAZE-yum! YUM! 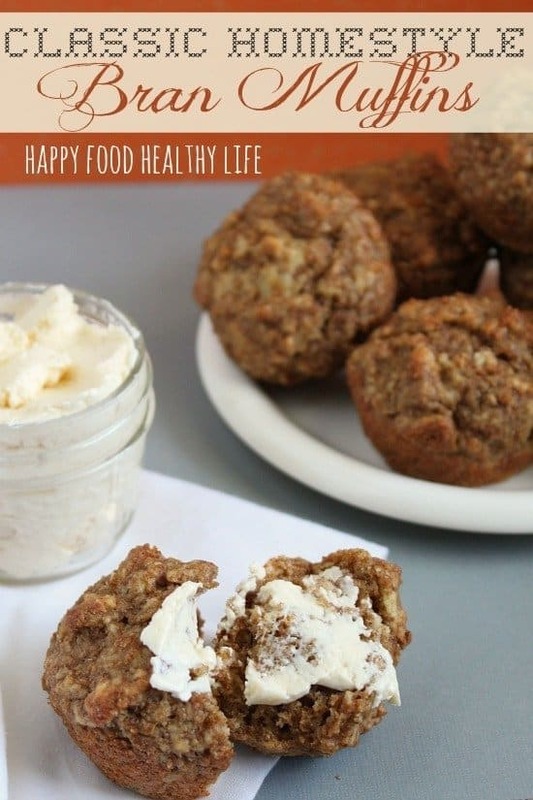 Bran muffins are a favorite of mine, hubby not so much so when I make these, they’re MINE…. ALL mine…. You’re SO lucky!! Wifey loves them just as much as I do, so it’s a battle to the last muffin! Bran muffins sound so delicious. I think I’d enjoy them with any meal. It’s true, Paula.. they’re great with breakfast, a snack, lunch, dinner… you name it… they’re yum all day! These look so delicious! These remind me of the pioneer muffins from Rainbow Gardens in Ogden. So good! My wife’s from Ogden and says they are just amazing!! Now I have to try them out too! Since you talked about these before I have been looking forward to the recipe. I will be making these sometime very soon. We need some healthy stuff around here. Good thoughts and prayers still headed your way. Oh man, I love bran muffins! I’m totally trying this recipe! Pinning now, thanks for sharing! Aren’t they SOO yummy?! I could eat bran muffins every day! Thanks for pinning, Jen! I just got through making these. I changed the recipe a little. I used regular milk (2%) instead of almond milk and added rasins. My husband says they are very good and I agree. Thanks Andrea! These are some of my favorite muffins, and I agree that raisins would be a great addition. I made these today made a few adjustments by adding an extra egg, one mashed banana, shredded pears and a diced apple with walnuts for topping. Oh wow, those sound like delicious additions to these muffins! I’m always switching it up. I’ve done pumpkin and berry but never apples and pears. I’m sure it was super yummy! Enjoy! I just made these… omg so good!! Just added raisins 🙂 78 calories for each.. yes please!